Best-in-class multicore performance, highly realistic 3D gaming, and energy efficient platform for exceptionally long battery life. Best-in-class performance that can run the most demanding applications, including 1080p HD videos, visually intensive 3D games and video, as well as High-Definition video conferencing. Applications run simultaneously and seamlessly with advanced multitasking support from the Snapdragon S4 processor. Take advantage of lightning-fast downloads with a fully-integrated 4G LTE modem. Capture lifelike photos and videos and quickly convert them into depth-defying 3D content. Snapdragon S4 processors are feature-rich, single-chip solutions that extend battery life and take your mobile applications to the next level of computing. Today, consumers are able to combine the full benefit of always-on, high-speed internet coupled with highly capable electronics designed to en-rich their lives with information and entertainment. With high speed LTE networks being deployed globally, to-day’s consumers expect their devices to go anywhere, do everything and run all the latest apps including browsing the web, email, chat and social networking, HD video and interactive gaming. It’s no longer a world solely driven by megahertz or simply adding more CPU cores to solve the performance hurdles faced by device manufacturers. Ever higher demands for performance and longer battery life on mobile processors are making it more difficult for traditional PC solutions to keep pace with the fully connected future. A new approach is needed. To fully meet this challenge, Qualcomm is taking the mobile industry to the next level of processing with the introduction of the Snapdragon S4 class of processors. The Snapdragon S4 class incorporates the latest in mobile architecture design and technology to address the demands for intelligent connectivity, high performance and energy efficiency. Qualcomm designs its own custom CPU cores based on the ARM architecture, which allows greater design flexibility at both the CPU and system level. Snapdragon S4 processors are the first mobile processors manufactured in 28nm process technology using the ARMv7 Instruction Set Architecture (ISA) to establish a new generation of performance. By migrating to a 28nm process, Qualcomm is able to deliver a highly compact, effi cient design able to scale across multiple form factors from mass market smartphones and tablets to compact laptops, delivering higher performance with less power. The S4 class repre-sents the industry’s only fully custom system on a chip optimized for the mobile experience and incorporates in-novations such as per-core dynamic power management, next generation highly parallel and programmable GPU, LTE world multimode modem, high speed dual channel interleaved memory, and programmable DSPs. 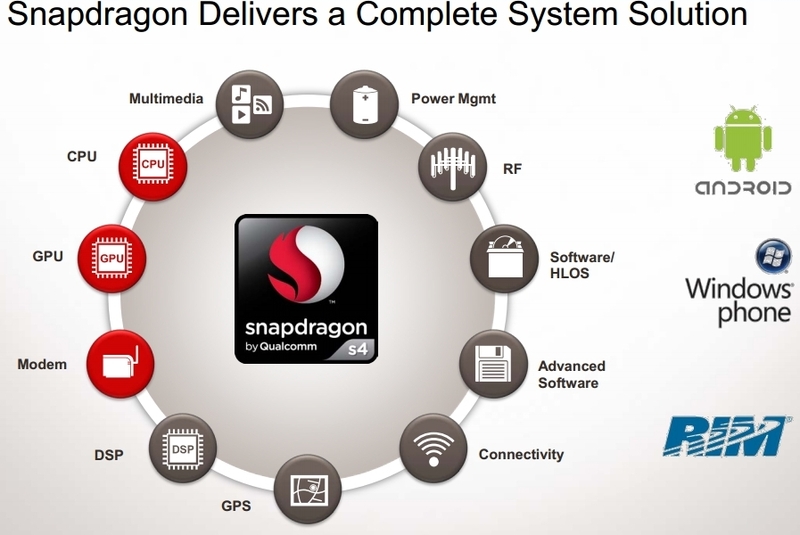 Snapdragon S4 processors will be available in single, dual and quad CPU configurations for maximum design flexibility. Significant Thermal Advantage. Figure 2 shows how S4 in 28nm process technology outperforms leading ARM based designs in 40nm G process by a significant margin, allowing greater OEM design flexibility. 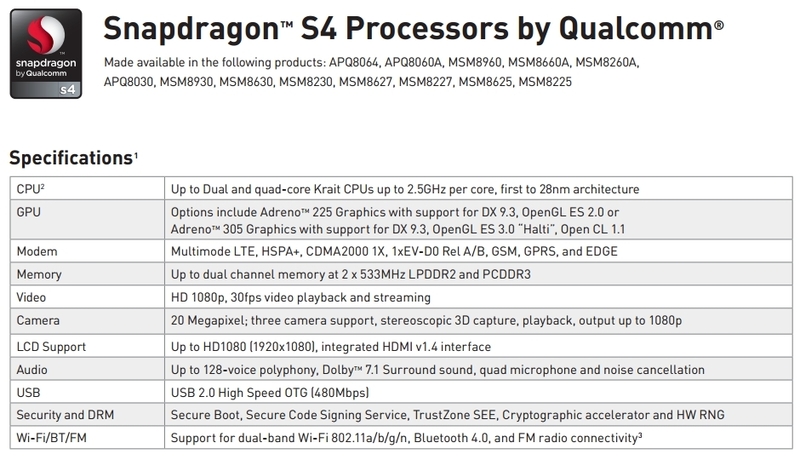 The Snapdragon S4 processors introduce Qualcomm’s second generation CPU, code-named “Krait.” Krait represents a new class of high performance CPUs while delivering unmatched energy efficiency. Krait Offers Unmatched Performance. 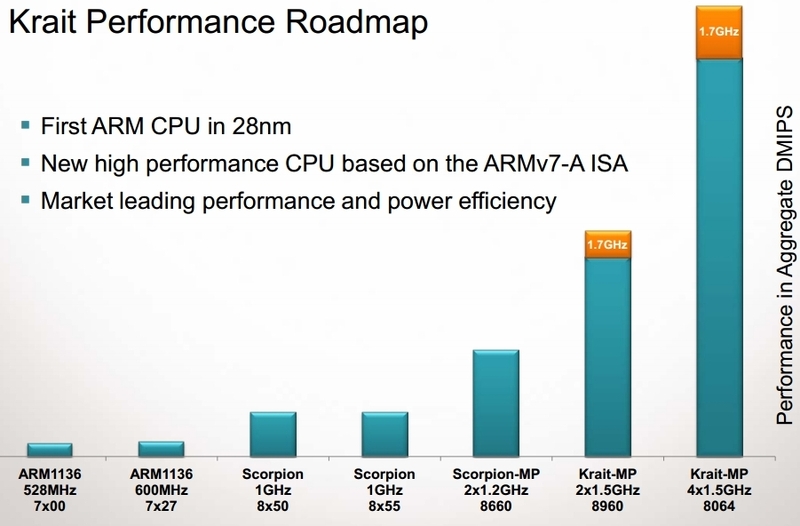 Krait outperforms current ARM CPUs on a core-to-core basis. To achieve the best performance and power efficiency, Krait includes key advanced design approaches:. Krait was designed to provide the performance headroom for a new generation of smartphones, tablets and laptops. A new pipeline architecture increases the performance of Krait by over 60% compared to Qualcomm’s existing Scorpion CPU micro-architecture. Krait also includes a performance-enhanced floating-point and SIMD functional unit which maintains the industry leading 128-bit data-path. Optimized computational units, including those for double-precision calculations, speed through math intensive applications with minimal power consumption. aSMP: Designing with Power Efficiency in Mind. 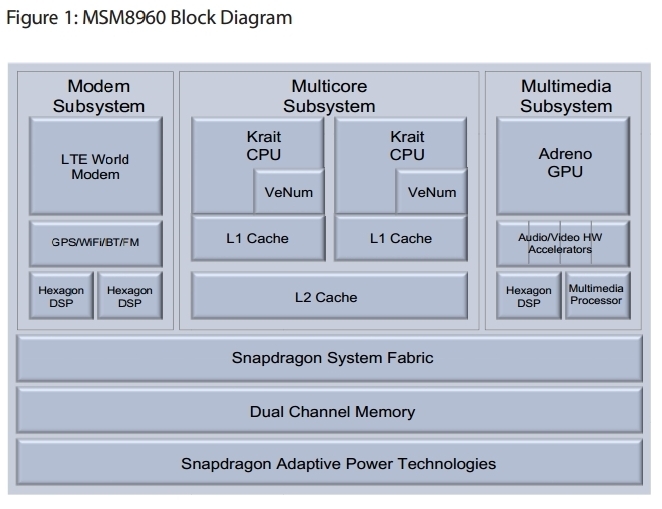 To achieve better power, performance and thermal envelope, Qualcomm designed the Krait microarchitecture as an asynchronous Symmetrical MultiProcessor system or aSMP. The difference between an aSMP and a synchronous SMP system is. •Independent clock and voltage: Each core in the aSMP system has a dedicated voltage and clock including the L2 cache. This enables each CPU core to run at the most efficient power point or voltage and frequency depending on the type of workload being executed. 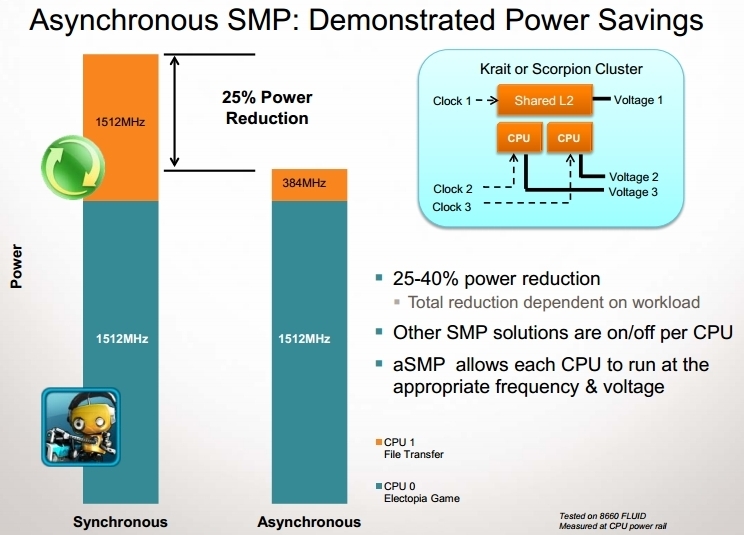 •25–40% power improvement: As figure 4 shows, the aSMP architecture results in a 25–40% power improve-ment over current synchronous SMP architectures. Reduced complexity: aSMP also eliminates the need for “companion” or “little” cores since each core in an aSMP system can be operated in low power mode due to the independent voltage and frequency control per core thus reducing the need for hypervisors or more complex soft-ware management of disparate cores. 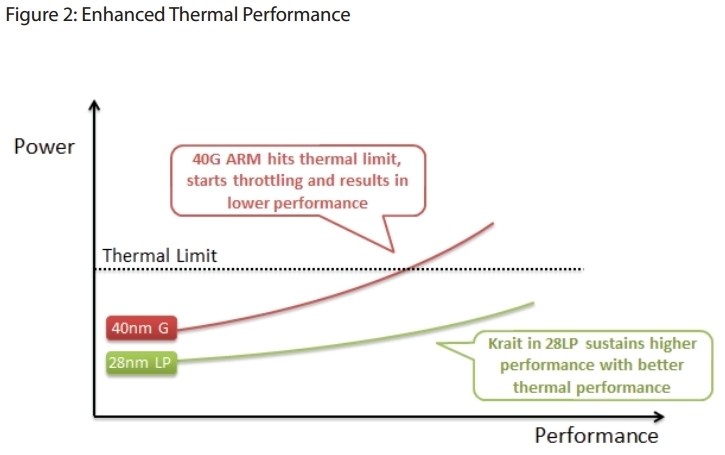 Krait Outperforms Current Processors at Significantly Lower Power. •New circuit techniques: Krait is also designed using a custom design flow that incorporates new circuit techniques to improve performance and power. The result is a very efficient and wide range of Dynamic Clock and Voltage Scaling (DCVS) which addresses usage models from active standby to mid and high level processing requirements. A Krait CPU can smoothly scale from low power, low leakage mode to blazingly fast performance. •Low power micro-architecture: Krait also includes new micro-architectural optimizations throughout the design such as more efficient branch prediction and more balanced pipeline utilization that achieve a balance between energy efficiency and performance. •Thermal: Krait power efficiency also results in a better thermal envelope. This allows Krait multiprocessor systems to run at peak performance for a longer time when compared to competitive solutions and simplifies the system level design like board designs, power delivery and overall system cost. 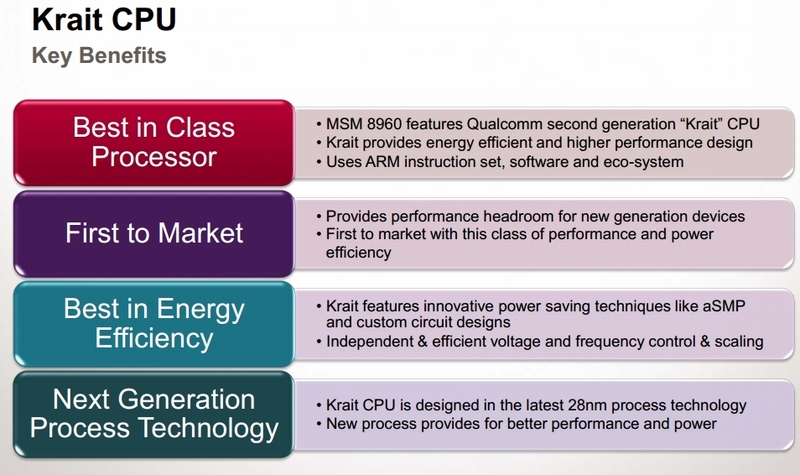 In summary, Qualcomm’s Krait CPU sets a new bar when it comes to performance and energy efficiency. New Adreno Embedded GPU. The S4 processor family incorporates the latest in GPU technology starting with the Adreno 225 Graphics Processing Unit (GPU). •50% increase in GPU performance: The Adreno 225 GPU delivers 50% greater graphics processing power over the previous generation Adreno GPU, Adreno 220, and six times the processing power of Adreno 200. 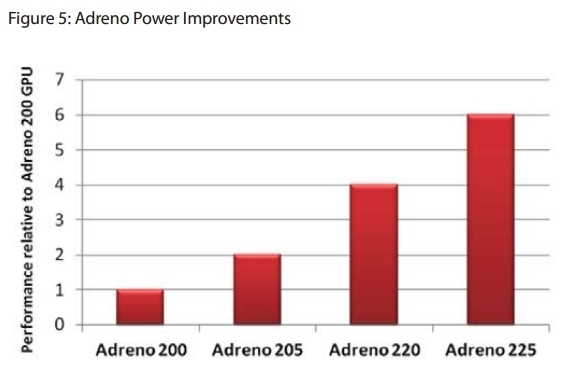 As the chart below shows, Adreno continues to deliver significant performance gains. See Figure 5. 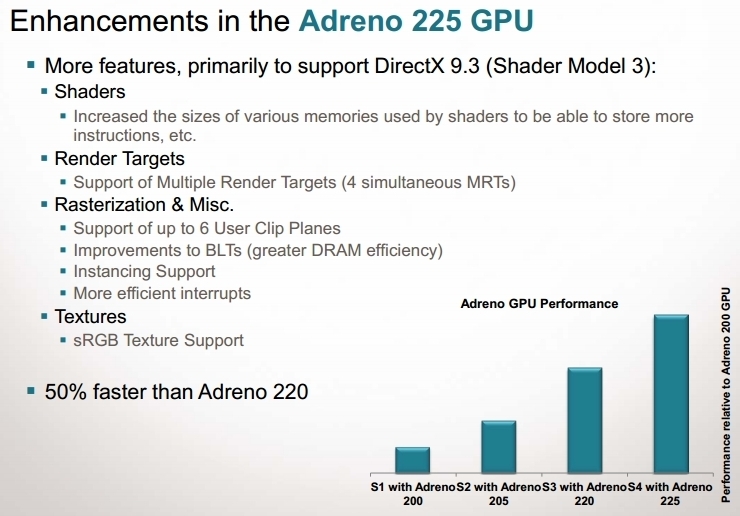 •Unified Shader Architecture delivers superior performance: Built on a proven track record of highly capable Adreno embedded processors, the Adreno 225 GPU is a fully programmable OpenGL ES 2.0 GPU with a Unified Shader Architecture (USA). Adreno’s USA maximizes the processing power of the GPU by offering flexible vertex and shader processing. This unique architecture is a significant leap forward in visual graphics quality from earlier “fixed function” OpenGL-Es 1.x GPUs. 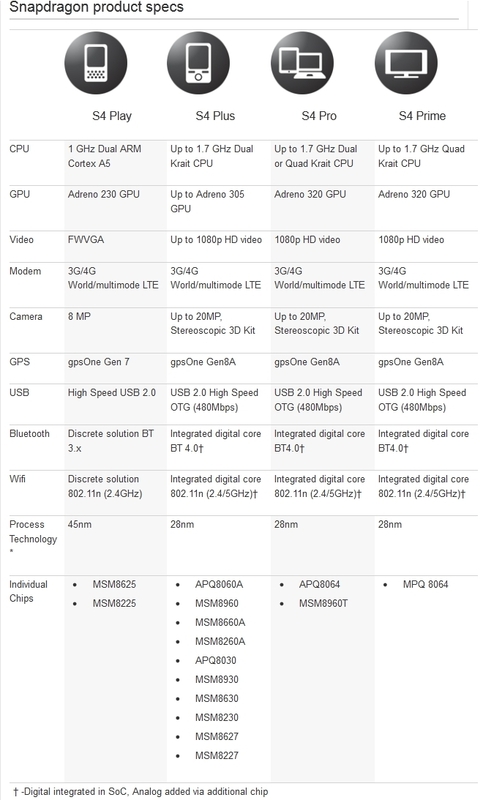 As Figure 5 shows, USA provides superior graphics performance. The Adreno 225 GPU has twice the memory bandwidth of its predecessor, which further contributes to better graphics performance at higher display resolutions.The APIs supported by Adreno 225 include OpenGL ES 1.1, OpenGL ES 2.0 and DX9.3. •Industry’s fi rst fully integrated 3G/4G world/multimode LTE Modem: Supports all of the world’s leading 2G, 3G and 4G LTE standards. It also includes integrated sup-port for multiple satellite position networks (GPS and GLONASS) as well as short range radios via Bluetooth, WiFi, FM and NFC. •Simultaneous voice and data:For LTE handsets, the 8960 modem enables UMTS/GSM voice and LTE data (CSFB), as well as simultaneous CDMA voice with LTE data (SVLTE). 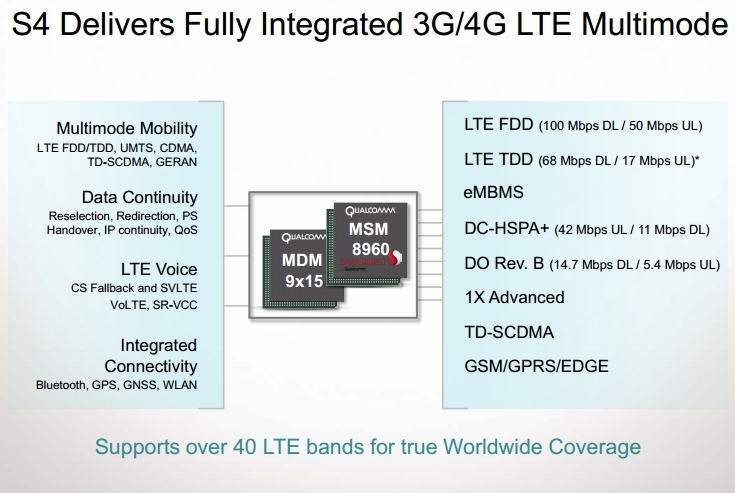 •Increased user throughput and network capacity: In addition, the modem incorporates Qualcomm’s latest generation of advanced receiver technology, such as Q-ICE™, QLIC and gRICE™, which equalize multipath signals and suppress multicell interference to significantly increase user throughput and network capacity for UMTS and CDMA respectively. •Power savings of 20–30%: The modem achieves its low power consumption through the use of standards-based power saving methods such as Continuous Packet Connectivity (CPC), in addition to Qualcomm developed techniques such as Average Power Tracking (APT) to manage power and thermal heat more efficiently, lowering power consumption by up to 20–30% based on QCT internal lab and field data. This allows OEMs to design smaller, thinner and sleeker devices with longer battery life. commonly-used frequencies (from 700–2600 MHz) and bandwidths up to 20 MHz, allowing its customers to address any mobile network opportunity whether the simplest single frequency implementation to the most extensive multifrequency global mode, whether 4G, 3G or 2G. •Solving signal interference: Though supporting multiple radio frequencies on the same chipset can present problems with signal interference, the MSM8960 utilizes Qualcomm’s expertise in radio and modem design to enable coexistence of many operating frequencies and modem concurrency scenarios. •Multimode for seamless handover: Qualcomm’s multimode “smart” modems can identify the best available network technology and quickly and seamlessly change to that technology in a way that’s transparent to the end user. For data, the 8960 modem utilizes reselection, redirection and packet switched (PS) handover to facilitate seamless handover to EV-DO and HSPA when users move out of LTE coverage. For voice, the 8960 modem can initiate circuit switched (CS) fallback to UMTS, 1x or GSM when the user is in an LTE data session. Qualcomm’s CS fallback solution implements the latest version of the standard—release 9 with system information (SI) tunneling—to reduce incremental call setup time to less than one second. CS fallback is a widely adopted standard for LTE voice and global roaming. the latest LTE release 9 features, such as SI tunneling for enhanced CSFB performance, eMBMS, enhanced position location for E911, as well as several IMS-based features such as VoLTE, SR-VCC, RCS and video telephony. •Real time adaptability for the best network connection: In addition to seamless inter-RAT cellular mobility, the MSM8960 chipset can automatically make real-time choices to connect to the best network currently available —whether 3G, 4G/LTE, WLAN or BT. This is done through a software stack in the modem that actively identifies and chooses the best available channel for any wireless communication. •Optimizing upload and download capacity: The software also employs real-time traffic control to optimize upload and download capacity for the smoothest connections. This is especially important for connected applications like interactive gaming and streaming media, where demands on connection capacity vary from moment to moment, yet smoothness and speed are critical. Qualcomm modems also go through an extensive pretesting, network interoperability testing and network certification process. This helps to ensure that in combination with their extensive set of modem optimized APIs, Qualcomm modems also provide an end-to-end solution that is compatible with the widest range of networks (public and private) with the best total connected experience while using the lowest battery power. Programmable Hexagon DSP™ Architecture Custom DSP: An Integral Partner in Overall System Performance. In addition to designing custom CPUs, GPUs and modems, Qualcomm also designs its own custom digital signal processors (DSP). 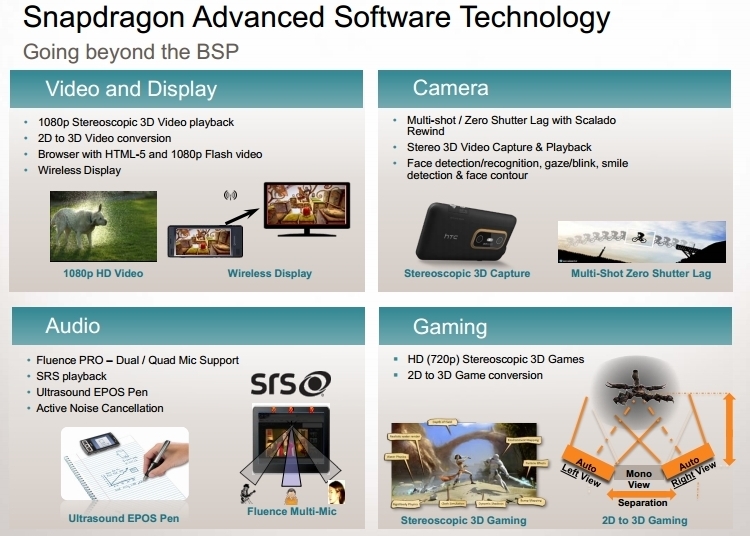 Hexagon™ DSPs have been an integral part of Snapdragon processors. Figure 8 shows the Hexagon DSP evolution and roadmap. multithreading (IMT) architecture, meaning each thread is resourced with independent program counters and registers. The Hexagon DSP is capable of running multiple applications concurrently much like a CPU but, because it’s designed for ultra low power, is optimally positioned for offloading specific tasks like audio, sensors, video, and imaging enhancement. •Highly efficient workload management: By leveraging the Hexagon DSP within the Snapdragon S4 processor, Qualcomm is able to achieve significant performance improvements without having to use additional CPUs or factor in having to dynamically switch tasks between cores which can introduce inefficiencies in performance and power. Enhanced Multimedia Efficiency using DSP Offloading. Hexagon DSPs have a substantial role to play in the area of multimedia. Most multimedia functions can be more efficiently processed using Qualcomm DSP technology. •Improving overall system performance: Hexagon DSPs are designed to ensure that the number of compute cycles needed to execute each function is very predictable. This high level of predictability ensures that Hexagon DSPs are extremely reliable and low power in multimedia applications. Once a function has been offloaded to a DSP on the Snapdragon S4 Processor, they are unaffected by user application loads on the CPUs. •Lower power: Hexagon DSPs not only free up cycles on the CPU, but also improve overall system performance by taking on additional tasks such as multimedia, imaging enhancement, augmented reality, and other multimedia functions. •Robust tool chain: The unique capability of the Hexagon DSP is the result of custom blending both CPU and DSP architectures. This allows Qualcomm to provide a robust tool chain to allow optimized programming in higher level languages (C, C++, etc.) targeting a powerful real-time operating environment. •DSP access program: Qualcomm’s DSP Access Program also allows OEM’s and ISV’s to independently develop customized DSP applications to further enhance Snapdragon processor operation.